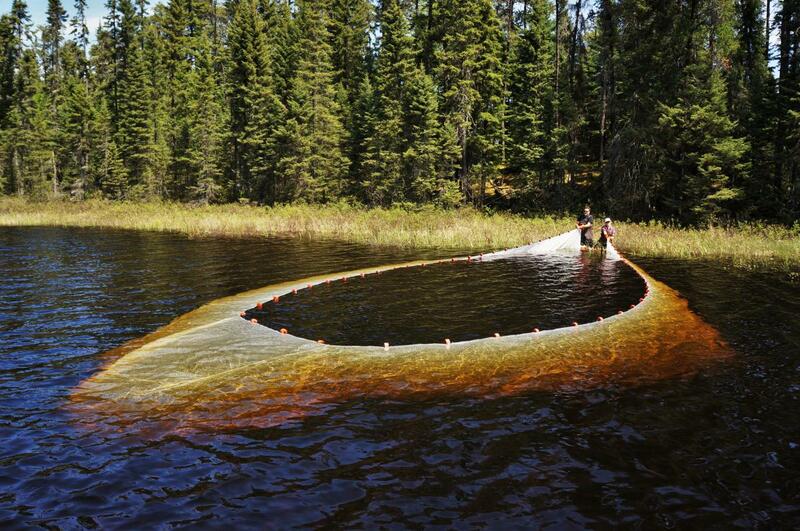 Research at the IISD Experimental Lakes Area (IISD-ELA) includes detailed monitoring of fish using state-of-the-art fish-tracking technology. In the fourth part of our series on the work that is going on at IISD-ELA into climate change, we explore research that has found that lake trout habitats in many lakes are at high risk of declining. ​This happens because preferred habitat for lake trout gets squeezed between surface waters that are too hot and bottom waters where dissolved oxygen is too low. Increases in air temperature and the length of the summer period, linked to climate change, will place this important species at risk of local extinction in many lakes. In Figure 1, we can see that in 2007 the preferred habitat for lake trout became “squeezed” as the open season progressed. From mid-August to early September, lake trout only had about 1 metre of usable habitat. Since Lake 375 is about 25 metres deep, this results in a very narrow band where they are able to survive. 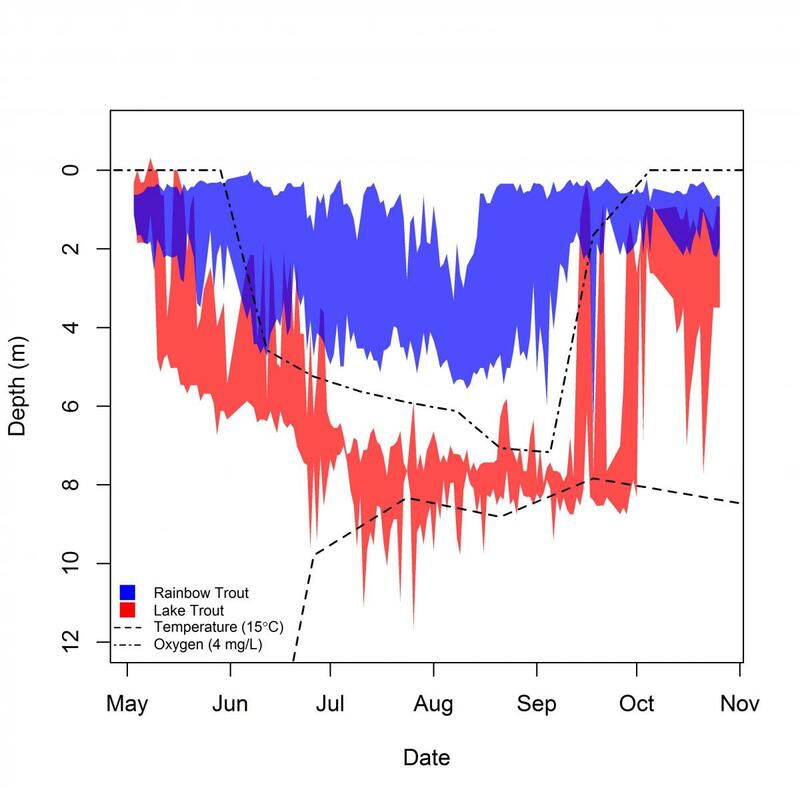 ​Using data from multiple years, we are able to see how water temperatures and oxygen concentrations that affect lake trout habitat are influenced by different climate conditions. With increasing global temperatures, we can likely expect surface lake temperatures to increase as a result. If lake temperatures increase, it may start affecting the habitat available to lake trout. If these changes happen too quickly and the species is not able to adapt in time, it is likely that lake trout near the southern edge of their natural range will begin to disappear. Our data also show that lake trout habitat is highly susceptible to changes in poorly oxygenated water in the deep portions of lakes. These low oxygenated waters are associated with nutrient loading and productivity of surface waters—as more organic material is produced through photosynthesis, the material eventually sinks to the lake bottom and is consumed by bacteria (which consume oxygen). So there is a linkage between more nutrients, more algae, more bacteria and lower oxygen concentrations in the deep layer of lakes. These data suggest that, under future warming scenarios, we will have to pay very close attention to the amount of nutrients we allow into our lakes if we want to protect lake trout habitat.